Perhaps, one of the most impressive ideas on dining chairs for glass table is genuine leather cushions. This is the kind of arrangement that will stay relevant no matter what. It is a very elegant decoration option that gives an exquisite look to any dining room. If you prefer firm chairs to soft ones, high gloss dining chairs is the best possible idea for a glass dining table. Sure, this is a rather demanding decoration idea that calls for additional glossy furniture in the room. Still, this could be an astonishing solution for those who would like to have a modern, but still very classy atmosphere in a dining area. 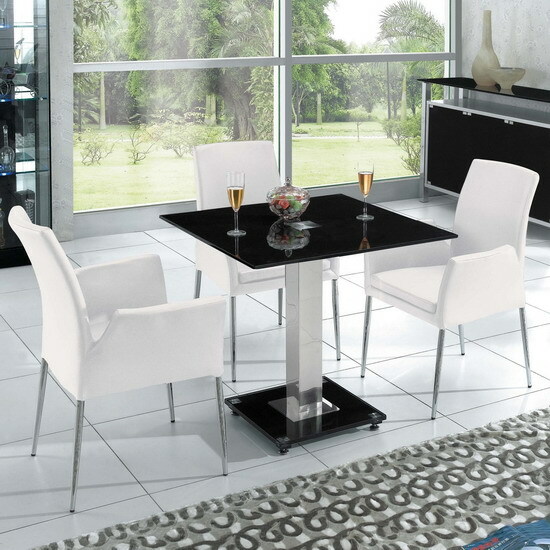 Another modern idea would be to blend in your clear glass table with matching clear ABS chairs. The arrangement will give your room transparency, making it lighter and more impressive at the same time. Sure, the idea is only suitable for modern rooms without any traditional decoration elements. A clear glass table will work fine with colourful plastic, too. Bright glossy chairs will accentuate the room, creating an eye catching and memorable decoration pattern. This is a perfect idea for minimalistic interiors, helping to downsize on other decorative elements in the room. The same colourful effect can be achieved with the help of fabric upholstery. Velvet works best for this kind of an arrangement, even though any thick textiles are appropriate. It is also possible to contrast table and chair shade for a more impressive effect. There are plenty of tinted glass tables that can be accentuated with a set of contrasting chairs. Black and white is one of the truly classic and the most popular combinations, even though other blends work fine, too. Colour is not the only element that can create contrast — different materials often look great together. For example, you can add a little bit of metal — chrome, for instance — into the picture. As a rule, metal works really fine with glass, giving the dining area a sleek, ultra modern look.